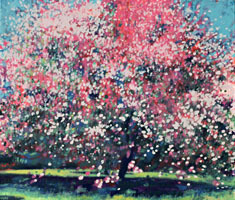 This is a reproduction of an original oil painting, Flowering Tree. The tree is located not far from my home; it is a beautiful old tree, very large, which in the spring becomes a huge mass of delicate pink blossoms. Under it are many dandelions spread out in the grass. I wanted to paint the tree not only for its beauty; to me it expresses the profusion of life, and an expansiveness and generosity of spirit. The image of the tree fills the entire canvas, appearing to go even beyond the canvas, and the horizontality of the forms stretches in a gesture similar to arms outstretched. As I usually do, I painted many semi-transparent underlayers of various colors - vermilion, deep violet, yellow green and deep blue - and gradually built up the image. These colors continue to show through in the finished painting in many areas; the pale pink clusters were painted last. The painting is also about the interrelationships of all these colors; their generally warm character (pink, red, yellow) also reflects the warmth of the image.